I have a theory that we’re looking at city cars the wrong way. The ideal car for a dense urban environment isn’t some little hatchback with a tiny engine, like a Smart Fortwo or a Mini Cooper. No, what you really want for city living is a hulking, cushy luxury sedan. And to test this theory, I’ve recently acquired this evil crime lord’s car: a black 1984 BMW 733i, with a five-speed manual to boot. Help! My Boss Wants to Buy an Evil Crime Lord&apos;s Car. What Should I Do? I’ve been living in New York City for a year and a half now, and I can tell you that two things truly define its driving experience: traffic and terrible roads. Parking is a challenge, too, but that’s not as bad as I expected. A bit of hunting and willingness to pay for a garage for a few hours (or a day) go a long way around here. But no amount of patience can cope with the fact that the city’s streets and highways are riddled with cracks and potholes and periodic cobblestones. Or that it can sometimes take close to an hour to creep just a few blocks. And getting out of the city to find some actually good driving roads? You better time that right or it’ll take the better part of an afternoon. Car culture definitely exists in New York, but everybody has to work harder to make it happen. So of all the cars I’ve driven here over that time—big SUVs, supercars, two-seater sports cars, hatchbacks and more—I have found that big luxury sedans cope with New York’s madness the best. I want something with a soft suspension to tackle the garbage roads, a powerful engine to get me out of the city as quickly as possible when traffic opens up, and a spacious, all-encompassing cabin to isolate me from the daily horror sights and smells of the big city. If you’re going to be stuck in traffic for hours at a time, shouldn’t you at least be in something that’s extremely comfortable, and can carry all your gear for a nice weekend trip out of town? Forget the tiny car. The luxobarge is what you want. At least, I think so. This leads me to this 7 Series, acquired off Craigslist recently. I sold my cars when I moved here from Texas and a lot of things—parking concerns, winter, press cars to test for work, not really needing a car, not being able to find something I really wanted, and so on—kept me from buying something new. But no press car offers the same experience as owning your own car. And I deeply missed working on my own vehicle, even though I am terrible at it. 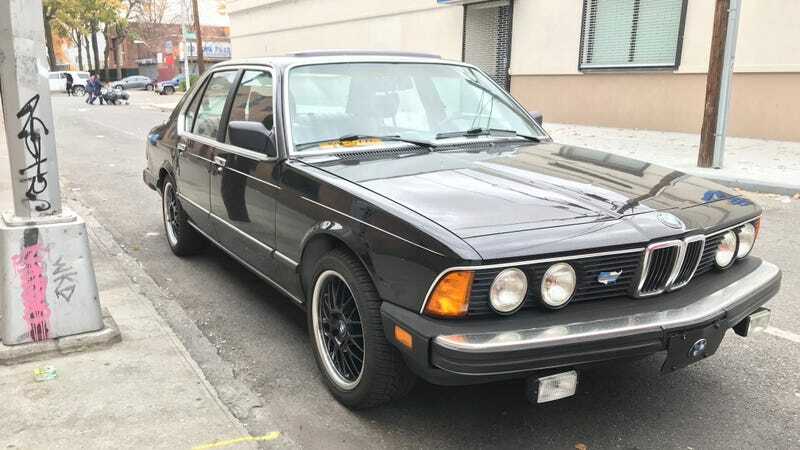 So when I saw this 7 Series pop up for sale, I told myself that if it was still available when Raphael Orlove and I finished our cross-country BMW 2500 drive, I’d go take a look. Just a look, you know? This beast—the E23, in BMW parlance–definitely checks the right luxobarge boxes. The suspension is so soft it laughs at even the worst roads I’ve found. The chairs are huge and all-encompassing, as is the back seat. The trunk could fit several dead bodies, and possibly did at one point. The interior is blood red, because things were better in the ‘80s. This was the range-topping BMW sedan in its time, and while the 7 Series models are generally considered also-rans compared the Mercedes S-Class cars—this is true in my own experience as well—I have always had a soft spot for them just for that reason. 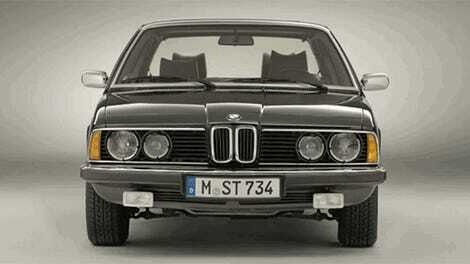 (The fact that an M7 never happened also hasn’t helped its cause with the usual BMW diehards.) The 7 is just not as loved as the 3, 5 and 6 Series cars of the time, and doesn’t that make it kind of cool and underrated? I love the shark-like looks of my E23, even with those hideous American bumpers. And as fanboyish as it sounds, there are few things as satisfying as rowing through the gears and wringing out one of BMW’s naturally aspirated inline-sixes. My car packs a 3.2-liter variant of the famed M30 engine, coincidentally the same motor as the 2500 we just road-tripped. BMW made it for nearly 30 years and, with the right care, it’s generally considered bulletproof. Overall, the difference in quality, comfort, quietness and fit and finish between this car and my old 325e is night and day. It makes an E30 feel like a riding lawnmower. Granted, in a perfect world this thing would have an automatic transmission. I have never minded doing the one-two shuffle in gridlock, endlessly clutching in and out just to move a few inches forward, but I can’t exactly say it’s fun, either. At the same time, when was the last time you even saw a 7 Series with a manual? I couldn’t pass that up. Plus, back in 1984, this car would have had a four-speed automatic. Forget the fast, smooth, paddle-shifting ZF8s we have today. Stuff like that is why enthusiasts hate automatics. I know it probably looks clean from these photos, and it generally is. The engine, gearbox, suspension, brakes, and most electrics work great. All the important stuff is solid. The clutch is brand new. The previous owner spent several years fixing it up and it shows. It even has a rear differential from an M5. But it’s no garage queen. Far from it. The driver’s seat motors have worn out, giving it a weird lean. It’s got a hole in the exhaust. The car’s automatic climate control system—a fairly sadistic setup with 10 buttons to operate everything—seems to work when it wants to. Those wheels are just ugly and are screaming for some period-appropriate BBS replacements. The radiator fan wobbles, and wiggles, and appears to be the wrong size. (I just bought the parts to replace it and the fan clutch.) The driver’s door handle doesn’t work right. It has an aftermarket stereo but a pretty dated one with no Bluetooth, which would be nice. And there is a bit of rust on one wheel well and at the bottom of one door. Not enough to make it a write-off, but something I’ll need to keep an eye on this winter with rustproofing, frequent washing, judicious driving decisions and a bit of luck. It’s a cheap old Craigslist 7 Series. It’s not perfect. But I didn’t want perfect, I wanted a fun daily driver and occasional project that can handle New York City. I’m not going to restore it or stick it in a hermetically sealed garage to sell it on Bring a Trailer someday. I’m going to fix it, care for it, drive it and enjoy it. The question is, can I pull all that off? Should I have just bought a Ford Crown Victoria to test my theory? Those are even cheaper than this thing, and nobody minds when half of your old trim falls off in one of those. A 7 Series has standards, standards I am obliged to keep. Winter’s pretty much here and while I plan on garage-keeping this thing, I don’t have my own house garage anymore, and that almost certainly make wrenching tricky. I need to start hoarding parts and adding to my tool collection again. And it’s an old 7 Series—I’m sure there will be no end to little, annoying things to fix. In the meantime, if you see me driving around the city in this, don’t be afraid to say hi. I’m happy to give you a ride in the backseat, or the trunk. Which Is Your Favorite BMW 7 Series?